Stamatis Iseris joined La Trompette as Head Sommelier in March 2018. Originally from idyllic Corfu, Greece, Stamatis developed genuine love and passion about food and wine from his youth as his mother was a Chef. Stamatis studied Hotel and Restaurant Management at university and has worked in various fine dining restaurants and five starred Hotels throughout his career mainly in Food and Beverage Management roles both in Greece and the UK. A few years ago, Stamatis decided to make his passion a real career ‘adventure’ as he likes to put it. For this reason he acquired higher Sommelier qualifications completing his studies for the WSET Diploma and also the Advanced Sommelier title from the Court of Master Sommeliers. After spending the last two years working as the Head Sommelier at the iconic Gleneagles Hotel, Stamatis arrived in London to continue his studies for his Masters and along with his team, to enhance the gastronomic experience of his guests. Originally a Burgundy lover, Stamatis is more than happy to guide you throughout the global vineyard via the amazing wine list at La Trompette. 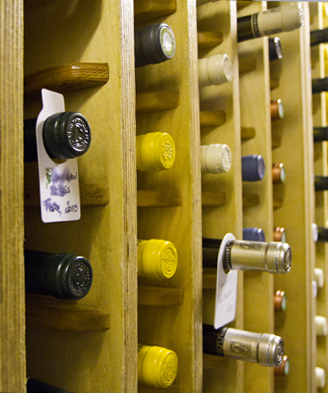 Click here to view a printable version of our wine list.